We held our annual Good Friday service earlier this evening. 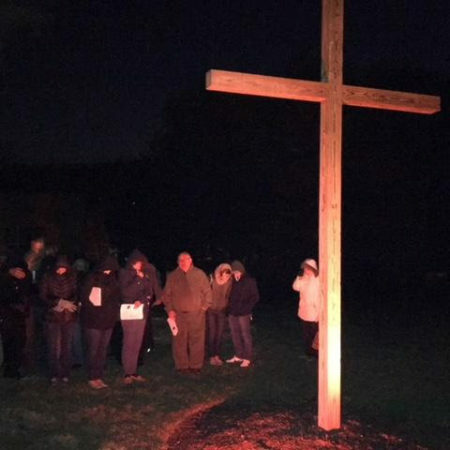 It is always a very solemn, stark time as we “journey to the cross.” It is an experiential service with readings, sharing and reflection on different meditations related to the last hours of Jesus’ life. The meditations include sharing the Lord’s Supper, being with Jesus in the Garden of Gethsemane, waiting with Peter at the fire and carrying the cross with Simon of Cyrene. When we stand at the cross we listen as Deke sings “Were You There When They Crucified My Lord” and then we “nail our sins” to the cross. Afterwards we come back inside to close out the service. At the conclusion we have a ritual we call “The Candle Of Hope” where we shut all the lights to signify the darkness of sin and the terror of that day. Then we light a single candle believing Jesus is the Light Of The World and each person is invited to come forward and light their candle in belief we hold on to the hope of Jesus’ resurrection. S. M. Lockridge (1913-2000) was a prominent African-American preacher known for his dynamic, passionate, and fervent sermons. One of his most famous sermons was “He’s my King” which we frequently show a clip from at our Easter Celebration Service. Several years ago author and speaker Tony Campolo was so impressed by Lockridge’s sermon on “It’s Friday. But Sunday’s Coming!” that he began to deliver the lesson himself and even wrote a book with that title. In this sermon Lockridge outlines all the reasons for despair and fear but reminds us, that it is Friday…the story has not been written, the book has not been completed…because Sunday’s Coming. It’s Friday. The soldiers nail my Savior’s hands to the cross. They nail my Savior’s feet to the cross. And then they raise him up next to criminals. It’s Friday. The disciples are questioning. What has happened to their King. And the Pharisees are celebrating that their scheming Has been achieved. But they don’t know It’s only Friday. Sunday’s comin’. It’s Friday. He’s hanging on the cross. Feeling forsaken by his Father. Left alone and dying. Can nobody save him? Ooooh It’s Friday. But Sunday’s comin’. It’s Friday. The earth trembles. The sky grows dark. My King yields his spirit. It’s Friday. Hope is lost. Death has won. Sin has conquered. and Satan’s just a laughin’. It’s Friday. Jesus is buried. A soldier stands guard. And a rock is rolled into place. But it’s Friday. It is only Friday. Sunday is a comin’!